The above photo, courtesy of the Gemological Institute of America, shows the range that natural Beryls occur in. Emerald, aquamarine, and Morganite are the three most famous Beryls, but they come in rarer varieties too. Every member of this family is linked by chemical composition and crystal structure: an aluminum beryllium silicate with hexagonal prismatic crystals. Differences in color and appearance are due to impurities in the crystals and geological conditions at the time the crystals formed. 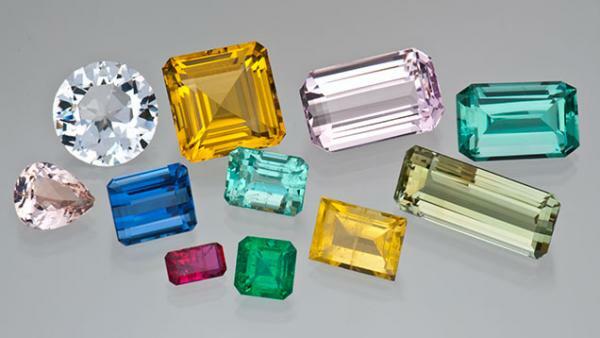 The members of the beryl group make excellent jewelry due to the variety of colors, brilliance of the material, and the high 7.5-8 hardness. Emerald has been called “the king of gems” due to its prevalence in lore through the ages and because it was the favorite gem of many monarchs, from Empress Cleopatra to the King of Spain. Today the popularity and value of emeralds has never been higher: it is the best-selling green gemstones, the May birthstone, and has been the most popular gem worn to the Oscars for several years! Emeralds were also popular in the past. The first emeralds known came from Cleopatra’s lost mine somewhere in Egypt, but for the past two thousand years have also been occasionally found in the mountains of modern-day Afghanistan and Pakistan. 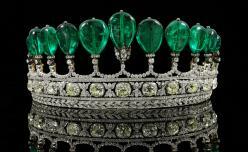 For this reason rough or tumbled emeralds featured heavily in the treasuries of Moghul emperors and Indian Rajahs. Across the Atlantic emeralds were also being mined by the Inca peoples of Peru and Columbia, and were worn as spiritual talismans by shamans and tribal elders. It wasn’t until the era of Imperialism, when Spain and Portugal conquered most of South America, that emeralds became more available. Spanish conquistadors were quick to modernize the emerald mines they found in Columbia, increasing the production and allowing them to ship massive quantities of amazing emeralds back to Europe where their popularity skyrocketed. To this day the gems from the Columbian emerald mines- which are still producing amazing gem emeralds- have set the standard for what emeralds should be. Emeralds owe their pure green color to trace impurities of chromium. Some of the stones have a strong blue undertone due to chromium and vanadium impurities combining, and some people will pay a premium for this glowing quality. While there are many different shades of green that emeralds can come in most experts tend to agree that a medium-dark green, with minimal blue or yellow undertones, are the most valued. Many of our clients tend to like the medium green shades since the lighter tone allows more brilliance out of the gem. Due to the fact that emeralds are cut to maximize their weight most emeralds are cut in octagonal shapes that mimic the original crystal shape- such as rectangular octagons (emerald cuts), ovals, or pears. Each shape can alter the resulting color of the gem. Rounds and ovals can make the gem brighter, whereas the emerald cuts can intensify and deepen the color. In the below photo, both gems would be considered fine quality, but the gem at right is a more pure green, and thus will command a slightly higher price than the stone at left. Emeralds form in an intense hydrothermal process (think erupting volcano) which means that the crystals are rarely perfect. Most of the crystals are shattered during formation, or end up heavily mixed with other minerals. This results in imperfections in the gems- the French term is “jardin” due to the fact that the inclusions can look like a garden growing within the stone. Therefore minor imperfections are totally acceptable when looking at emeralds, so long as they don’t drastically reduce the brilliance or durability of the gem. We tend to like the inclusions in emeralds because they are like birth marks making each gem unique. The below photo shows a range of acceptable clarity in gem quality emerald. Note that even the AAA gem has some internal characteristics. I encourage anyone interested in emeralds to view them in person. It is impossible to capture the true color and glowing nature of an emerald on camera, and it is also important to visually compare emeralds from different sources. Most emeralds on the market today are a medium green, nearly opaque, and come from Brazil- we see no point in selling these, because they aren’t pretty. We choose to focus on the dark bluish green gems from recent discoveries in Zambia, but we also carry the classic Columbian material that we know and love. When we show emeralds we often ask people to choose the stone they like best before ever discussing grading or price because in our experience some of the less expensive stones can have lots of personality and are often chosen over the pricier options. That being said, we can stock or order gemmy 1ct emeralds for between $750-8,000, depending on clarity and color intensity. While all emeralds are green beryls, not all green beryls are emeralds. To be an emerald the gem must be medium to dark green, with minor yellow or blue modifying colors, and colored by chromium. This naming issue became a hot-button issue after a discovery of green beryl in Nigeria. These stones are colored by vanadium, and feature a deep mint green color which many people think is dark enough to be dubbed emerald, but is in fact intense green beryl. On the opposite end of the spectrum there are green beryls that are often sold as aquamarines. They come from the same mines as aquamarine in Brazil and Africa, but tend to have a yellowish green or seafoam green shade. We are huge fans of green beryl in our store because we can get large, beautifully cut gems at affordable prices, but we think it is important as jewelers and gem dealers to accurately describe what we sell. 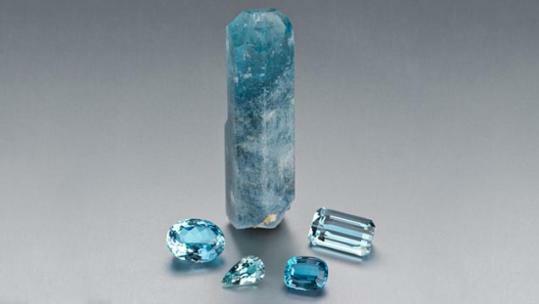 Aquamarines are the second most famous beryl member and the birthstone for March. The name aquamarine means “seawater” because most natural aquamarines are a light to medium blue with green undertones, caused by iron impurities. Today the more popular colors are pure baby blue, to deep blue if you can find them. No matter what color one prefers aquamarines are scarce on the market. 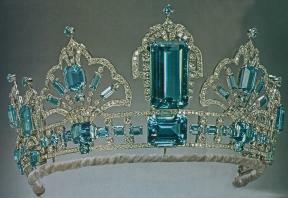 Even 60 years ago fine aquamarines were more available- hence the above amazing crown given to Queen Elizabeth from Brazil. Now most jewelers are forced to sell blue topaz as an alternative, but we directly import our aquamarines so that we can offer the natural gem (a passion of our owner). The most famous aquamarine mine among gem connoisseurs is the Santa Maria mine in Brazil. For the last 100 years it has produced both the largest and the most intense natural aquamarines on the market; in fact any deep blue aquamarine is referred to as “Santa Maria color” due to the fame of this mine. These gems are priciest aquamarines due to depth and purity of color coupled with rarity. The above gems represent this deep color. The top two are from a new mine in India and are exceptionally rare, the bottom left and center are African, and the gem at right is Brazilian. The most known form of aquamarines consists of the medium-light sky blue and greenish blue gems that we see a little more often. Since the 1990s the majority of quality aquamarines have been coming from East African countries. What is amazing about the gems from Madagascar and Mozambique is that the gems are not treated to attain their beautiful color. While not as dark as some Brazilian gems, these tend to have an amazing brilliance and life to them. We actually find that people tend to choose the gems with the subtle green undertone over the more pure blue ones. It should be noted that there are many other minor sources of aquamarines that produce beautiful gems, but we only carry them occasionally. These sources include two American localities: Pala County, CA and Mt Antero, CO; as well as Tanzania, India, Sri Lanka and a growing source in China. Depending on source and color, we have 3ct aquamarines ranging from $250-$1,800. 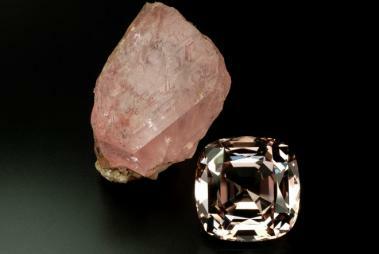 Morganite is the peach to pink variety of beryl and the pink tone is due to manganese. Morganite has a fascinating background. Not many people know that famous banker JP Morgan was an avid gem collector. In fact his donations established the permanent gem collections in the Field Museum, Chicago and the Natural History Museum, New York. In the early 1900s he financed gem hunting expeditions in Madagascar and California to be led by Tiffany & Co’s lead buyer, George Kunz. In both of these trips a previously unknown gem was discovered. In Madagascar they found pink beryl, and in California they found some pink beryl and pink spodumene. In honor of the two key men involved, they named the former Morganite and the latter Kunzite. These gems are often confused with each other, but are totally distinct gem species; with Morganite being more pink or peach than the pale lavender-pink or orchid color of Kunzite. The above morganite is 182cts (!!) shown with a large piece of rough, courtesy of Nomads. So what should you look for in Morganite? This is a hotly debated issue. Gem collectors say that a pure pink color is the rarest, and when it is a deep pink it is the most desired. Current fashion trends are showing that more people like the light pink with a subtle hint of orange, commonly referred to as peach Morganite. We think it is most important to choose the color you like best, coupled with an excellent cut so that the gem’s natural brilliance can be center stage. Like the majority of the gems we sell, we try to source natural gems. However the treated material offers an orangey peach color in large sizes that is stunning, so we will order this on request- and at really affordable prices. Today, the majority of peachy Morganite comes from Brazil, Nigeria and East Africa while California and Pakistan produce a more pure pink, and these can be had for around $150-$400 per carat. The above deeper colored gems are totally natural in color, but they only come in smaller sizes and command a premium from collectors. The bottom gems have been treated, so the have the more desirable peachy tones. Heliodore, or golden beryl, refers to yellow, gold, and orange beryls, while goshenite refers to the pure beryl without color. These gems are all quite rare, and we source them more for collectors that for everyday pieces. Our favorite examples come from Pakistan and Sri Lanka where the gems are a pure sunshine yellow and natural in color (the above right gems). We have found some very intense yellow treated gems from Africa (above left) and some orangey gold gems from Brazil. Goshenite is found all over the world but is hard to source because most of the rough gem material, which is colorless, is treated to produce other colors such as pale blue, yellow, or peach. Even though we have only seen a handful of fine bixbites in our career they deserve a place on this description of beryls. Bixbite is the name given to raspberry or red beryls found in the Wah Wah Mountains in Utah. They are similar to emeralds in that they tend to be heavily included, but they only occur in very small sizes. Thus 1ct red beryls that are eye-clean are more expensive than comparable emeralds or even diamonds! 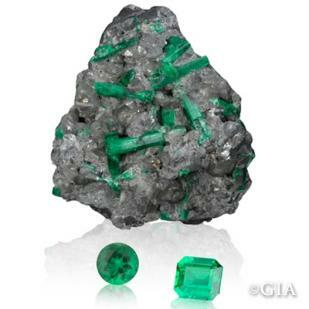 Gemologists consider these gems to be the rarest beryl, and we say the only thing rarer than a Bixbite is a gemmy Bixbite! Please contact us for pricing and availability of our awesome beryls!